On Friday night, Joe DeGuardia’s Star Boxing’s Rockin’ Fights lived up to every bit of its expectation. Fans at The Paramount witnessed, knockouts, all out brawls, great boxing skills, and a main event for the ages. The main event last night was a throwback to the glory days of boxing when neighborhood rivalries filled the venerable NY fight clubs as a sold-old crowd engrossed in the thrilling, tooth and nail war betweenDANNY “EL GALLO” GONZALEZ andJOHNNY “HITMAN” HERNANDEZ. The crowd was so loud that you could barley hear yourself think. The incredible back and forth action was amplified by the crowd’s alternating and competing shouts of “Johnny” and “Danny”. Hernandez started the fight fast, boxing smartly in the first two rounds landing crisp combinations to the stalking Gonzalez. Gonzalez closed the distance in the third round and from that point on it became a war of attrition in a spectacular fight. Gonzalez finished a bit stronger as the ten-round epic battle came to a close with everyone standing and cheering. 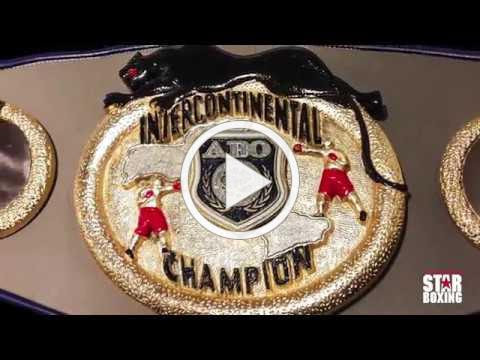 When the scores were read to a captivated crowd, the elated new ABO INTERCONTINENTAL CHAMPION, Danny Gonzalez fell to his knees at the center of the ring with his new title on his shoulder. Gonzalez improves to 17-1-1 (6 KO’s) while Hernandez drops to 9-4 (1 KO). The scores were 95-95, 97-93, and 98-92, for DANNY “EL GALLO” GONZALEZ (majority decision). 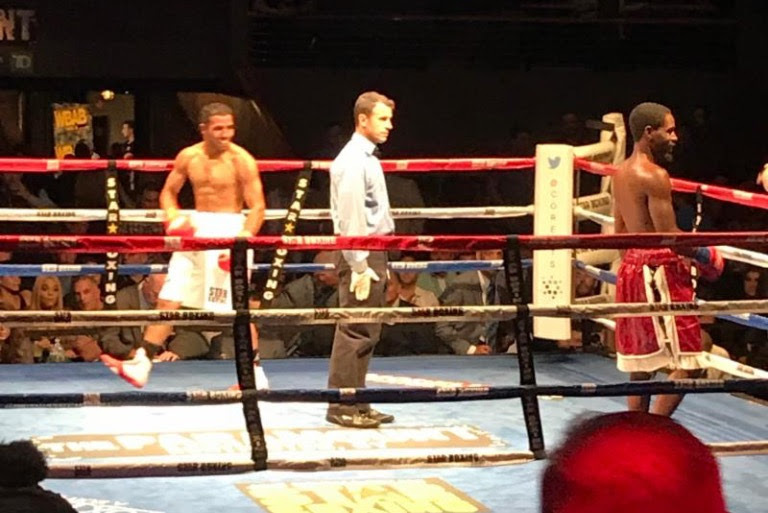 The semi-final Jr. Welterweight fight also had the sold-out crowd on its feet as East Hartford’s “ACTION” ANTHONY LAUREANO and Waco, Texas veteran, MARQUIS “THE HAWK” HAWTHORNE stood toe to toe exchanging hard blows for most of the fight. the Undefeated Laureano came away with the hard earned victory by unanimous scores of 59-55, 60-54(2x). Laureano improves to 9-0 3KO’s, while Hawthorne falls to 5-9-1 1KO. 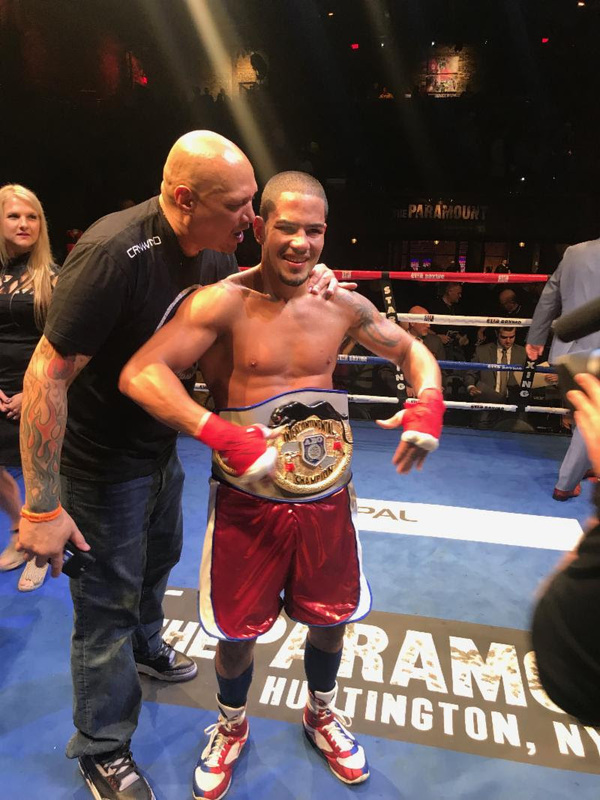 Opening the show was another thrilling battle between Bellport native ALEX VARGAS and tough Philadelphia PA warrior DERRON LAWSON in a 4-round welterweight bout. Vargas was a decorated amateur and had vocal throng of fans in attendance for his pro debut. Both fighters displayed tremendous skill and heart as the two battled for the entire fight, exchanging multiple combinations with no regard. The fight quickly turned into an all out war. It was give and take as Vargas landed vicious head and body shots, then Lawson took his turn doing the same. At the end of the 4-rounds, Vargas took home the unanimous decision victory in his pro-debut. Vargas improves to 1-0, Lawson falls 0-2. Scores were 40-36 on two cards and 39-37 on the third. 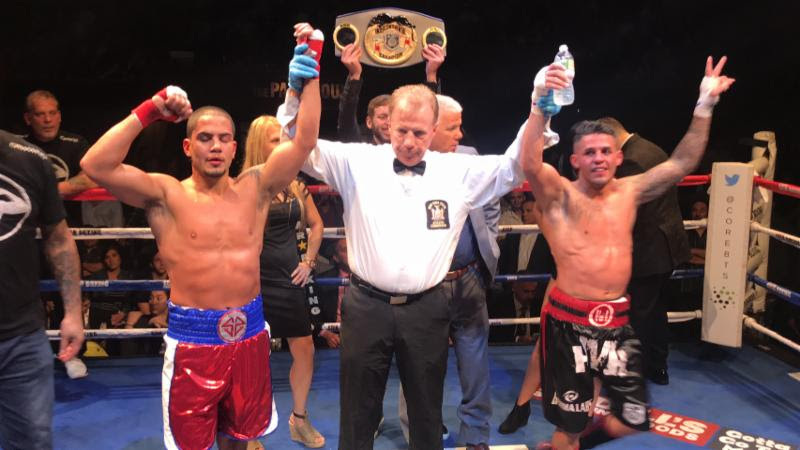 A showdown between two pro-debuting prospects, NY Golden Gloves finalist JARED BONILLA (Bellmore) and Western New England Golden Gloves Champion, JOSE MAYSONET (Hartford) also brought the crowd to its feet. After a few back and forth moments, a right hand by Maysonet caused Bonilla’s legs to unsteady. Smelling blood in the water, Maysonet pounced, dropping Bonilla just over fifty seconds into the first round. Twenty seconds later, Maysonet landed flush again, dropping Bonilla, causing the ref to call a stop to the action. In a flash, Maysonet earned his first career victory, by TKO. Bonilla falls to 0-1. Popular Scottish Light-Heavyweight, SHAUN KENNEDY, picked up his first victory as a pro taking a unanimous decision from Buffalo pro-debuting PEREZ AUGHTRY from Buffalo, NY. Both men exchanged blows through-out the crowd-pleasing 4-round bout. The scores were 40-36 across the board. Kennedy goes to 1-0 with 1 no contest. Several well-known local fighters, past and present, were in attendance including #3 World rated Long Island Light Heavweight Joe Smith Jr., popular Long Beach Light Heavy Seanie Monaghan, undefeated prospect Tyrone James, the ever popular Vinny Maddalone, Contender Star Devaun Lee, Curtis Stevens, Larry Barnes and David Telesco. Star Boxing is pleased to announce the this incredible night of fights will be aired on NESN (New England Sports Network), via tape-delay at a date and time to be announced next week. Commentating the show was NESN’s own Jahmai Webster and former middleweight champion, Dana Rosenblatt. The next Paramount show is set for November 30th. Get your tickets early!!! DANNY “EL GALLO” GONZALEZ (16-1-1 7KO’s) fighting at The Paramount for the ninth time, against, JOHNNY “HITMAN” HERNANDEZ (9-3 1KO) who will be in his first main event and eleventh bout at The Paramount, for the ABO Intercontinental Title. Returning to The Paramount almost one year to the date of his last bout at the venue, “ACTION” ANTHONY LAUREANO (East Hartford, CT 8-0 3KO’s) will take on tough Texan, MARQUIS HAWTHORNE (5-8-1 1KO). Hawthorne poses a great test for Laureano as the taller fighter, with great reach, thus Laureano will look to close the distance, by scoring on the inside. In a battle of the pro-debut’s, NY Golden Gloves finalist, JARED BONILLA (Belmore, NY Pro-Debut) will take on Western New England Golden Gloves champion, JOSE MAYSONET (Hartford, CT Pro-Debut) in a 4-round, super lightweight bout. 23 year old, NY Golden Gloves champion, ALEX VARGAS (Bellport, NY Pro-Debut) will make his pro-debut at “Rockin’ Fights 32”. Vargas will step in with DERON LAWSON (Philadelphia, PA 0-1) who returns to The Paramount coming off a majority decision loss at “Rockin’ Fights”. Vargas vs Lawson will be a 4-round welterweight bout.